Who does CAM Detroit serve? Those living with friends and families are not considered literally homeless. How do clients access the CAM? In January 31, 2018, CAM transitioned from a call center model to in-person access point model. What does the coordinated intake process look like for clients at the access points? Once at an Access Point, clients will be asked to sign-in at the front desk and complete a CAM information sheet. Clients will first meet with CASS Diversion staff to explore alternatives before entering emergency shelter. If another alternative cannot be identified, clients will then meet with CAM Intake Staff to determine if shelter is available for the night and, if so, to determine the appropriate placement. CAM Intake Staff at Southwest Counseling Solutions and Community and Home Supports have been trained to administer the Vulnerability Index – Service Prioritization Decision Assistance Tool (VI-SPDAT). Once the assessment is completed with CAM Intake Staff, is there a wait list? CAM Detroit does not use a wait list for its housing resources. Instead, we have a prioritization process where the needs of the household are matched with the most appropriate housing solution as housing becomes available. Housing is never immediate or guaranteed. Transportation will be provided in various forms, as needed, from the CAM Access Points to shelter. What happens when a client shows up at a shelter for housing assistance? What if it is after hours? Clients presenting at a shelter provider should be referred to a designated access point. If it is after hours and a bed is available the client can spend a night, but client will be ask to present at an access point the following day during hours of operation. What if a client doesn’t go to an access point the following day? 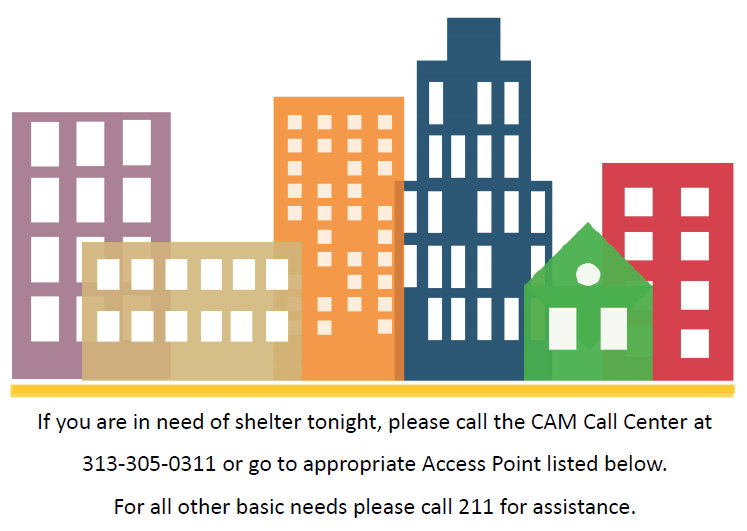 If clients enter shelter and do not come to an access point, they will not be included in the CAM process and services. We are relying on shelter staff to stress the importance of visiting a CAM access point and helping clients get to the access points. If a client shows up at a shelter after hours and shelter beds are not available, where should the client be directed? Clients presenting at a shelter without bed availabilities should be directed to the Neighborhood Service Organization’s Tumaini Center for single adults, Warming Centers for families and single adults in the winter months. Shelter staff should call to check for bed availability before sending clients to another shelter or warming center. What happens if there are no current housing openings in the housing program type determined to be most appropriate for the client? If a client appears appropriate for a referral to Permanent Supportive Housing or Rapid Re-housing and there are no openings, the client will remain in the prioritization process. Clients will be matched to the most appropriate housing type as it becomes available, but clients should be working toward their own housing solutions as housing through the CAM process is never immediate or guaranteed. How is the effectiveness of CAM being tracked? Data tracking and reporting are major priorities in the CAM and throughout its transition to the access point model. Data is reported on a monthly and quarterly basis, and past reports can be accessed here. Are clients given their assessment “score”? Clients are not provided with a numerical score. However, staff will discuss which housing solution that best fits each client’s housing need.